The high-res Masterclass DAC4 Digital to Analogue Converter offers a well judged alternative to rival DAC’s delivering a near analogue experience at genuine Sugden audio quality. Earn 1815 loyalty points when you order this item. 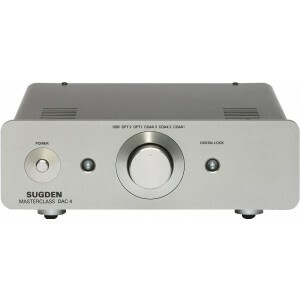 Sugden Masterclass DAC-4 Digital to Analogue Converter offers a well judged alternative to the plethora of other current DAC’s with sound quality top of the list, 'Rescuing music from technology’ could not be more appropriate. Instead of accepting and using the latest digital trends, Sugden have produced a product meticulously engineered to play music. With our own conversion circuits and data reformatting, a near analogue experience can be enjoyed. The DAC-4 is without limitations and has no over sampling or digital filtering so every stage of the conversion process is dictated and produced at genuine Sugden sound quality. Connection is available via three coaxial inputs, two optical inputs and a USB input. With six inputs in total the DAC-4 can take centre stage for all your digital components. The ability to accept high resolution data up to 24bit/192k on the coax SPDIF inputs provides flexible music options. The analogue class A output stage is crucial to the DAC's performance.